The original Mount Shadwell Hotel, dating from 1855. The new facade was erected in 1927. This building still stands as Evans' IGA grocery. Note the original Mac's Hotel in the background. The two-storeyd hotel was built in 1910. 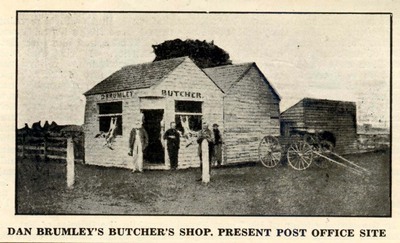 Brumley's Butcher Shop stood on the corner of Dunlop and Webster Streets and was on the site of the current Post Office. Note the sheep carcasses hanging exposed at the windows. 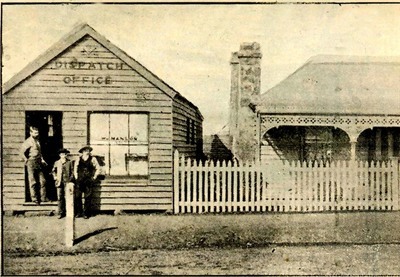 The third 'home' of the Mortlake Dispatch, first published in August, 1869. The dwelling at right was Manson's home, Mr Willison Manson being the owner and editor of the newspaper at the time. 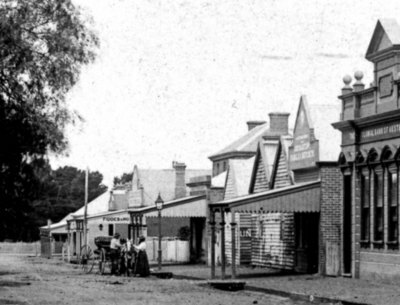 The office stands on the site of what is now 'Ewe and I' gift shop. 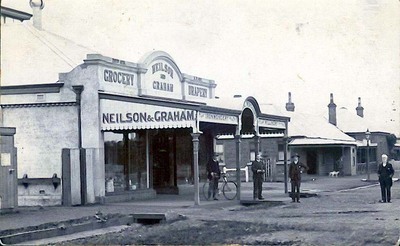 At right is the National Bank, now the site of the Mortlake Library. Note the two-storeyd Penrose House at the centre of the image.